Cutler served in the government during the height of the “lavender scare,” a terrible period in American history when thousands of federal employees lost their jobs just because of their sexual orientation. 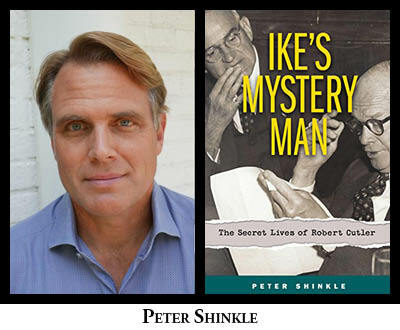 The biggest revelation in Shinkle’s book is that Cutler oversaw the executive order signed by Eisenhower that led to the purge of so many of his fellow gay employees. Drawing on thousands pages of unpublished diaries and letters, Shinkle draws a startling portrait of a tortured public official. He also captures the painful conditions in the nation’s capital in the early 1950's: “A strange climate of paranoia and dishonesty permeated Washington, a city where vicious hunts for homosexuals were led by men themselves suspected of being gay [like McCarthy and Cohn], where people laughed as [Joseph] Welch and McCarthy sparred maliciously over the words pixie and fairy … and where senators practiced the art of gay blackmail against political foes. Shinkle will discuss his book in a conversation with Charles Kaiser, the acting director of the LGBTQ Policy Center at Roosevelt House, and the author of The Gay Metropolis, which is being republished in an updated edition in June for the 50th Anniversary of the Stonewall Uprising. Please join us for what promises to be a fascinating discussion. Peter Shinkle worked for 19 years in the news business, most recently as a reporter for the St. Louis Post-Dispatch. He covered the federal court system, and wrote investigative stories on subjects ranging from improper disposal of radioactive waste to the political influence of the payday loan industry and the employment of undocumented immigrants by a major retailer. He is the great-nephew of his book’s subject, Robert Cutler. Peter lives with his wife Marguerite Ross Shinkle in Portsmouth, Rhode Island.